For those wanting to experience a smaller more traditional cruise ship that was built for ocean passages, TransOcean Cruises of Bremen is set to begin welcoming English-speaking passengers on board its ocean cruise ship Astor, as well as four of its river cruisers. Elsewhere, on the Danube, Dertour is once again opening up the fabled river cruiser Mozart, which was once operated by Peter Deilmann but has recently been sold only to German-speaking passengers. Finally this week, news has arrived from Marseilles-based Compagnie du Ponant that with the delivery of its new provisionally named L’Equatorial from Fincantieri in June 2013, three ships will attempt the full Northwest Passage across the Canadian Arctic in 2013. For some time now, a small number of German ships have been welcoming English-speaking passengers on board. This started with Peter Deilmann’s 22,496-ton 548-berth Deutschland in 1998, and more recently spread to Hapag-Lloyd Cruises, which now offers a number of “international cruises” each year that operate in both English and German on board its 28,890-ton 408-berth ultra-luxury vessel Europa and its two expedition ships, the 6,752-ton 164-berth Bremen and 8,378-ton 184-berth Hanseatic. All other German operators restrict themselves to the German-langage trade. Now, TransOcean Cruises of Bremen, operator of the 20,606-ton ocean cruise ship and five river vessels, has advised The Cruise Examiner that it plans to begin accepting English-speaking passengers on the 590-berth Astor, a classic cruise ship that can carry up to 650 when all berths are full, as well as on certain of its river ships. The line, which was founded in 1954 and previously operated as Transocean Tours, was taken over in 2009 by Munich-based Premicon AG, which controls a fleet of twenty-five river cruisers, some of which also operate for Avalon, Scenic, TUI and Viking River Cruises. Premicon also has shares in a number of container ships operated by BBC Bremen and a bulk carrier, as well as other interests. The Astor was completely refitted at Lloyd Werft at Bremerhaven in 2010, during which time she was completely updated, receiving modern new bathrooms, a lighter internal colour scheme, and having some public spaces opened up into outdoor/indoor areas to make the lounges feel more open and less enclosed. Some UK passengers will already be familiar with the general layout of this ship as she is a near sister to Saga’s Quest for Adventure, which is now sailing as Saga Pearl II and once operated as Transocean’s Astoria. 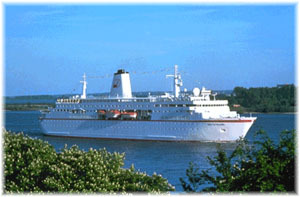 The Astor was built at Kiel in 1987 with an idea of reinstating the old Europe-South Africa liner service, but after those attempts were unsuccessful, she became a fixture in the German cruise market, at first under Russian ownership as the Fedor Dostoevskiy, and then from 1995, under German ownership, she reverted to the name Astor. 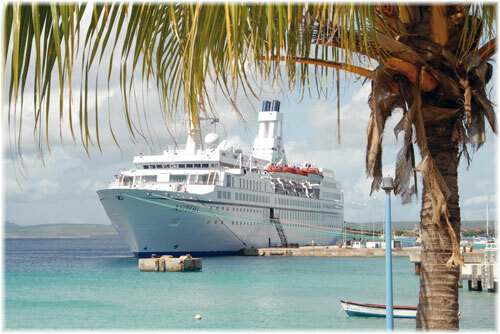 English-language menus and daily programs are already available, but it is understood that TransOcean will be looking to allocate certain departures to English-speaking passengers so that there are enough on board to be able to offer a fully supported program of shore excursions in English as well as German. In the meantime, those who visit the TransOcean web site will now find an English-language version now available (www.transocean.de/en). 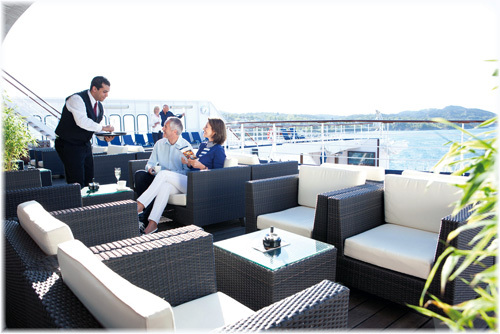 Itineraries on offer this summer include a large selection of Mediterranean departures from Nice, Barcelona, Venice and Istanbul, and Baltic, Norway and Spitsbergen departures from her main base at Bremerhaven, as well as Kiel and Hamburg. 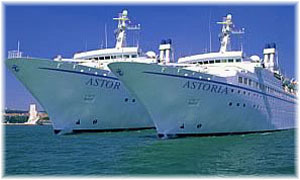 Next winter the Astor will undertake a 130-night “Indian Ocean and Round Africa” cruise, departing Barcelona December 1, Heraklion December 8 or Sharm el Sheik December 16, with calls at Hodeidah, Salalah, eight calls in the Arabian Gulf with an overnight at Dubai, five calls in India and Sri Lanka, calls on the Maldives, Seychelles, ten additional calls in the Indian Ocean at Kenya, Zanzibar, Madagascar (four calls), Reunion and Mauritius, five calls in South Africa, two in Namibia and one call in each of Angola and Mozambique. These will be followed by eight calls in West Africa and visits to the Canary Islands, Madeira and Lisbon and seven calls in Europe before ultimately returning to Bremerhaven for the 2013 summer season. This cruise can also be booked in sectors such as Colombo to Mombasa, Cape Town to Dakar and Dakar to Lisbon or even Cape Town to Lisbon. Finally, an English-language brochure is also now available on four of TransOcean’s river cruisers, the Belvedere on the Danube, the Bellevue on the Rhine and Moselle, the Maribelle on the Rhone and Saone and the Sans Souci on the Elbe. Built in 1987, MV Mozart was called in her time the most luxurious river ship in the world. Refurbished annually, this incomparable vessel is resplendent with polished rosewood and original art. She is also distinguished by the large size of her hundred staterooms and the number of public areas. Of her staterooms, 97% are outside and are identical in size at 203 square feet, except for two suites at 406 square feet. Some are configured as twins, others with a queen-size bed. 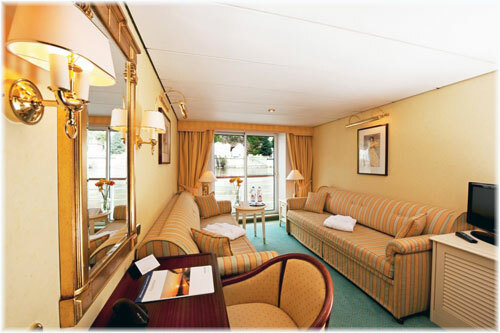 The three inside cabins have three berths and can be used by families travelling together. All are well appointed and have large marble bathrooms equipped with hairdryers and terrycloth bathrobes. On the upper deck, all accommodations also feature French balconies opening up onto the river and the passing scenery. The Mozart, once the flagship of the Peter Deilmann river cruise fleet, now works for German tour operator Dertour, and is still arguably one of the most luxurious cruise vessels in the world. She also features a large forward lounge, two bars, a café, beauty salon, library, gift shop, complete fitness centre and wellness spa, heated indoor pool, sauna, whirlpool, laundry, safe deposit boxes and a conference room, as well as an infirmary with a qualified doctor on board. Her Sun Deck has plenty of deck chairs and blankets, if needed. In addition to her forward-facing lounge, one of the Mozart’s most striking attributes is a picture window right in the bows of the ship, which is located forward of her indoor swimming pool. This has been made possible because with dimensions of 394 by 75 feet, the ship’s accommodations are spread over two hulls. On the upper deck all outside accommodations also feature French balconies. Dertour, who also have an office in the UK, now market two itineraries, both operating round-trip from Passau, which is easily reached from Munich airport. The 7-night itinerary includes visits to Vienna and Bratislava and turns at Budapest, while the 14-night itinerary proceeds further downstream to include the Iron Gates and the Danube Delta, with additional calls in Belgrade, Giurgiu in Romania and Rousse in Bulgaria, as well as at Tulcea, Romania, near the Danube’s exit into the Black Sea. The first commercial cruise ship to transit Canada’s famed Northwest Passage was Lindblad Expeditions’ Lindblad Explorer, which made the passage in 1984. Arctic conditions can very from year to year but the only problem she encountered was off the coast of northern Alaska, where fog and ice forced her to backtrack for ten hours, then sail closer inshore to escape the permanent polar ice shelf. Since then, a number of expedition cruise ships have made the full transit, and from time to time, one of them has had to turn back because of ice conditions. In recent years, other ships have introduced partial transits of the easternmost end of the passage that make only part of the full passage and then return east. Most recently, in the summer of 2010, both of Hapag-Lloyd’s expedition ships, the Bremen and Hanseatic, transitted the full Northwest Passage, with one ship traveling in each direction. While the Bremen traveled from Nome, Alaska, to Reykjavik, Iceland, the Hanseatic sailed in the opposite direction, from Kangerlussuaq, Greenland, to Nome. During their cruises, the two made a rendezvous in the High Arctic near Cambridge Bay. In 2011, the Bremen made the passage from Kangerlussuaq to Nome while the Hanseatic made only a partial transit of the eastern end of the Northwest Passage on a cruise that began in Kangerlussuaq and ended in Reykjavik and followed the traces of Franklin and Amundsen, exploring the icy coast of Greenland as well as the untouched island world of the Canadian Arctic. In 2012, the Hanseatic will once again make a full 25-day transit from Nome to Reykjavik, departing Nome on August 14. In 2013, however, Hapag-Lloyd Cruises plan a two-ship transit again, with one ship sailing in each direction. But now comes word from Compagnie du Ponant that it too hopes to send a ship across the Northwest Passage in 2013 after it takes delivery of its third Le Boréal class ship from Fincantieri. Based on initial plans, the 10,900-ton Ice-classed ship, provisionally named L’Equatorial, is due to make her 10-night maiden voyage from Venice to Lisbon on July 2. From Lisbon, details that have yet to be confirmed call for an 11-night cruise to Reykjavik, a 7-night round-Iceland cruise, and a 13-night cruise from Reykjavik to Kangerlussuaq, another 13-night cruise round trip from Kangerlussuaq and then an attempt at the Northwest Passage. L’Equatorial’s Northwest Passage voyage would set off from Kangerlussuaq on August 25 for a 21-night transit, to arrive at Anadyr in Russia’s Far East on September 15. If all goes according to plan, the Northwest Passage transit would be followed by cruises in the Russian Far East, two cruises via Japan to Hong Kong and three 10-night cruises between Hong Kong and Singapore.